In ages past, a wise emperor ruled over a vast swathe of the Western kingdoms in Barnabas' stead. His name has long since faded into legend, and then further into myth and is now on the verge of being forgotten - his legacy, however lives on. Long had the emperor been a lover of all things exotic and wild, and so at his insistence (and against the loud and frequently argued advice of his chancellor of coin) a series of Games were held, in which men and women competed for prizes in games of skill, strength and endurance. Around these games were exhibitions of animals gathered from the lands and oceans surrounding his holdings, and both the emperor and his people were content. Soon, though, the people tired of seeing tigers and lions paraded through their streets in cages of iron. The novelty of gazing at such beasts faded quickly, replaced with the annoyance of having to close their shops, bakeries and businesses as the menageries made their gradual, winding way through the normally bustling city streets. The emperor found that not only his chancellor, but the voice of the senate were speaking out against further Games. Quickly they were joined by other advisors who counselled against such costly showings of power, and the emperor turned elsewhere for his decadent pleasure. This is the way the story ends in most tomes of history and lore; the emperor achieves great victories at home and abroad, the banners of Barnabas are hoisted atop flagpoles across the lands, and his name lives on in memory and monuments until time and weather erode both. His zookeeper, however, was left with a quandry; cages full of exotic and dangerous animals, a shrinking budget, and few people trained to look after them. He quickly sold the tigers and lions to the furrier, who skinned them and sold their hides to the general public as rugs or cloaks or hangings for their walls. The heads of deer and penguins adorned the walls of noble houses across the empire, as noblemen proudly claimed that they themselves had claimed the head of such notable prey - none admitting that it had been a passage of coin rather than crossbow bolt which had brought the trophy to their door. But for the larger creatures and those animals whose nature was hardly glamorous enough to turn their hide into a coat or a trophy, what next? The answer: the special projects unit of the emperor's military. Long renowned for their innovative use of siege weaponry and their reworking of old tactics and strategy, the SPU turned their attention to the zoo to see if anything could be rescued from the financially disastrous Games. Skunks were quickly acquired for their pungent output, and were loaded into catapults and trebuchets to be fired over the walls of besieged cities. Giraffes were fitted with viewing canopies and used as mobile vantage points in battle. Finally, elephants and rhinoceri were trained in the art of cavalry combat. It quickly became apparent that the short sight and changeable temperament of rhinoceri ruled them out of long term cavalry operations, though it was discovered that releasing a number of the beasts into the enemy's pottery showrooms could cause a great amount of damage in a relatively short period of time. The elephants, however, took to it like ducks to water. It was no time at all before the Emperor's First Elephantine Legion was born. Draped in red cloth over hard iron barding to complement the already resilient hide of the elephants, the beasts made fearsome steeds - and when the SPU perfected the design for the shed-like construction which rode upon their backs and housed archers and pyro-alchemists alike, a true weapon of war had been created. Though few in number, the elephant cavalry turned battle after battle to the emperor's favour. Enemies learned to fear the distant trumpeting which heralded their arrival, and though new tactics were designed to fight around them or neutralise their influence, few succeeded. Not all of the emperor's activities and deeds have been forgotten. Other nobles who followed the word of Barnabas had taken note of the unit's success, and implemented similar schemes to add to the might of their armies. Some were successful, most were not - but when, inevitably, the emperor's armies were crushed and his lands invaded, the influence of elephantine battle cavalry did not die with him. 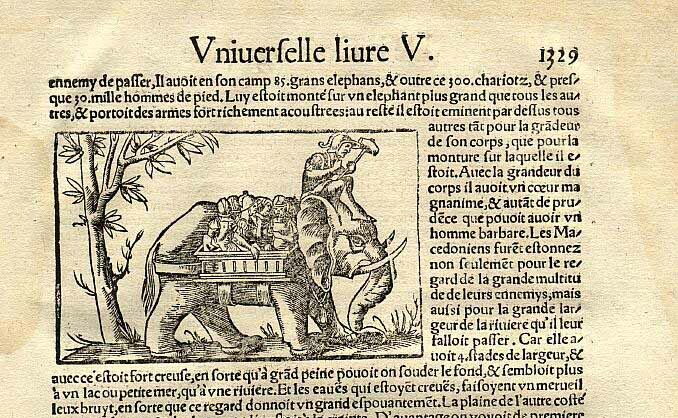 Even now, such units fight for the glory of Barnabas - as often as not these are mercenary units, as the individual elephant's upkeep cost is high and to stable such a unit permanently in one's army would be financial suicide. Their story has begun to spread amongst the nobles of the land once more, though, and the high pitched trumpet of the frenzied elephant has graced more than one battlefield victory with its triumphant note. The nobility of the faith of Barnabas are coming to know the strength of the elephant cavalry once more. This is not a guild for highly motivated, active players who want to finish top. If you're a new player who'd like to learn the ropes, or if you're an experienced player who's fine with logging in once every day or two and fighting the occasional war, then think about joining up. Mostly, I intend to build until I'm bored and then look to pick a fight. Me - the GM. I make decisions. Someone else - the AGM. They take over if I disappear. Everyone else - the rank and file of the guild. If anyone shows aptitude and willingness to be an AGM, chances are they'll be promoted.